The constitution calls for a “planned economic policy,” in which the state and law “shall regulate the system and process of planning with the participation of the Powers of State, and political, economic and social organizations shall be duly represented.” But that planning model, which has never been implemented in Honduras, has been overtaken by the neoliberal model, based on market freedoms, adopted in the 1990s. Amendments passed in 2012 were intended to create special employment and development zones, but not a single one has emerged. Since the 2009 coup, Honduran society has been polarized by violations of the law, the concentration of power, abuses, corruption, and other problems – all aggravated by the widely contested election of last November. Business, workers, farmers, trade unions, academia, non-governmental organizations, and other sectors have been unable to find agreement on how to deal with the nation’s pressing problems. ANC supporters say that true national reconciliation is going to require a new social pact that a new constitution can create. Backers also argue that the ANC would breathe new life into the political parties – deeply discredited by the corruption and chaos engulfing them – and allow them to become a mechanism for intermediation between society and the state. An assembly, they say, would bring political leaders and the people together in pursuit of better alternatives to the current system. A system of checks and balances, including a new judicial system, would help guarantee the separation of powers and enhance citizen participation in public policy. Prospects for an ANC do not look good at this moment despite important endorsements, such as that of the Honduran Catholic Bishops Conference in a public letter last December. Most of the political elite, responsible for setting the country on its destructive course, stridently oppose the idea, but proponents feel the elites will eventually have to accept one. The “national dialogue” launched after the November elections has made no progress or, worse, has aggravated tensions. The black cloud over those elections and the surge in corruption cases under investigation – an important achievement of the Misión de Apoyo contra la Corrupción y la Impunidad en Honduras (MACCIH) and its partners working under the Attorney General – have driven politicians to dig in their heels. Their efforts to hold onto power, prevent transparency, and block accountability puts them directly against the sort of reforms an ANC would represent. Even when the political class eventually allows the ANC proposal to take off, many obstacles lay ahead. One of the first – and extremely difficult – steps would be selection of a truly independent Supreme Electoral Tribunal to oversee a referendum on the ANC and the election of assembly delegates. The questions on the ballot would be simple, focused on support for the ANC and support for presidential reelection, but the task of making Honduras an inclusive society, with transparency, accountability, and respect for the rule of law would take the sort of vision and discipline that only a new constitution would provide. While critics claim an ANC would be playing with fire, it’s certainly better than the current situation in which we are all threatened with being burned. * Hugo Noé Pino is currently a professor and coordinator of a Ph.D. program at the Universidad Tecnológica Centroamericana (Unitec) in Tegucigalpa, Honduras. Honduras: Hernández Stealing the Election Too? Honduran President Juan Orlando Hernández and the military have declared a “state of emergency” – tantamount to martial law – to ensure that the President wins a second term, but irregularities in the vote-counting and the harsh suppression of the opposition probably will poison political discourse and hinder democratic progress for years to come. The government declared the emergency, which will run for 10 days, on Friday night after days of growing tensions over mysterious actions by the Supreme Electoral Tribunal (TSE) – heavily stacked in favor of Hernández – that erased opposition candidate Salvador Nasralla’s five-point lead earlier in the week and moved toward formalizing the incumbent’s victory by 1.5 percentage points. Senior government officials themselves have characterized the action as a “suspension of constitutional guarantees.” Hondurans are now living under a dusk-to-dawn curfew; radio and TV stations have been warned against publicizing opposition claims of fraud; and street confrontations are growing. Media confirm several deaths, but opposition leaders say that more than a dozen demonstrators have been killed. Opposition videos showing military and police violence, including chasing individual protestors and shooting them, have been removed from Facebook and other venues, although still photos of the victims can be found. The TSE has agreed to hand-count about a thousand ballot boxes with “irregularities” in three of 18 departments, representing about 6 percent of the votes, but the opposition claims that several thousand more boxes have been compromised and need to be reviewed. International reaction has been mixed and generally muted. The EU’s observers have held firm on demanding a full vote count and expressing, diplomatically, skepticism about TSE’s handling of it. Observers for the “Grupo de Lima,” which has been active on the Venezuela issue, issued a “position” paper on election day (November 26) urging calm and patience with the vote count, but it has released no apparent updates since then. OAS observers have taken a similar low-key position. Although the Trump Administration may conceivably be working behind the scenes, neither the White House nor State Department has done publicly more than urge calm. Vice President Pence, who previously praised Hernández “for his leadership in addressing security and governance challenges,” has remained silent. The U.S. chargé d’affaires has said Honduras is in “a new, unprecedented phase in the electoral process” but limited herself to calling for calm and a full vote count. The audacity of this apparent election fraud and crackdown on Hernández’s opponents dwarfs the many other charges of corruption brought against the Hernández government, including some validated by the OAS Mission to Support the Fight against Corruption and Impunity in Honduras (MACCIH). Although different in form from the coup in 2009, these events also threaten to undermine the nation’s political stability, economic wellbeing, and institutions necessary to building democracy. The U.S. reaction suggests that Washington will acquiesce in the ongoing abuses and Hernández’s second term despite the obvious irregularities and rights violations. The United States – convinced as in the past that political leaders who are “our SOBs” can make good partners – has often countenanced dubious elections. Moreover, both the Obama and Trump Administrations were persuaded that Hernández has been their faithful, effective ally in combating the drug trade, despite evidence of official involvement in it, and the temptation to turn a blind eye to less-than-democratic political outcomes must be strong. The OAS, the “Lima Group,” and other intraregional groupings do not appear poised to weigh in despite their good intentions. Neither do Mexico, Guatemala, and El Salvador appear likely to condemn a neighbor for engaging in practices that are ongoing or fresh in their own near pasts. The Inter-American Democratic Charter, a historic document laying out hemispheric values, is of little value in the absence of the political will and ability to enforce it. Now is a crunch time both for the OAS and for those governments that advocate some teeth to the charter. At this point, they appear likely to cave – to the detriment of democracy in Latin America. The OAS “Mission to Support the Fight against Corruption and Impunity in Honduras” (MACCIH) approaches its first anniversary in April with some gains and many challenges. Launched after months of negotiations with the government of President Juan Orlando Hernández, MACCIH was created partly in response to widespread street protests by the Indignados (the “Outraged”), angered that the president’s campaign had benefitted from $300 million embezzled by officials of the Social Security Institute (IHSS). Hernández was widely believed to accept the mission only because his tenure in office – and a possible second term – were in danger. MACCIH was inspired by Guatemala’s CICIG, the UN-backed commission supporting that country’s judicial institutions, but Hernández insisted on major differences. He consented only to a mission of the OAS, generally seen as weaker than the United Nations. MACCIH is weaker than CICIG in that it cannot initiate its own case investigations and must channel all its investigative and prosecutorial work through Honduran authorities. (CICIG enjoys full investigative police powers and can initiate its own wiretaps and surveillance.) MACCIH is headed in-country by a “spokesman” for the OAS Secretary-General, who nominally leads the mission from Washington, and its $2 million first-year budget has been only about one-sixth that of CICIG’s annual budget. As a result, MACCIH opened to skepticism that its slow start hasn’t dispelled. Its investigations have produced virtually no corruption-related arrests or prosecutions. Setting up the office took much of 2016. The head of criminal investigations only arrived in the summer, and the public security office only opened this month. In contrast, a Honduran Police Reform Commission has sacked over 3,000 police officers. Civil society organizations complain of MACCIH’s lack of impact, and a novel “observatory” comprising academic institutions and civil society groups remains ill-defined. MACCIH’s decision not take up the investigation of the high-profile murder of environmental rights activist Berta Cáceres has seemed to sideline the mission from a case that emblemizes impunity, even if it seems not to involve far-reaching corruption. However, MACCIH has scored some wins. It has embarked on a handful of complex corruption cases, including the IHSS case that sparked its creation. The mission helped Honduran prosecutors prepare charges of arms possession against Mario Zelaya, the highest-profile suspect in the IHSS case, which kept him in jail long enough for more serious charges to be brought. It helped secure two laws – to regulate campaign financing and to create a nationwide anti-corruption jurisdiction with its own selected judges and prosecutors. MACCIH’s in-country leader, former Peruvian Prime Minister Juan Jiménez Mayor, has been forward-leaning in acting on his mandate. MACCIH gained support in an early test late last year. In November, its concerns about several Hernández nominees to the Tribunal Superior de Cuentas, an audit court with special powers over corruption investigations, earned the ire of Honduran senior officials who complained to Secretary General Almagro. The appointments were not altered, laying bare the mission’s limitations. But Almagro stood by his organization’s analysis and role, with Jiménez Mayor emerging stronger as his special representative, not just his spokesman. That same month, the board chair of Transparency International, José Ugaz, visited Honduras and urged civil society organizations to help ensure MACCIH’s success. Since then, they have showed a more positive attitude toward MACCIH, and more witnesses are now cooperating with the mission. Comparisons between MACCIH with CICIG may arguably be unfair just one year out. Observers recall that CICIG had difficulty showing impact in its initial investigations and was criticized as ineffectual. Delivering on its ambitious mission to help curb corruption and impunity – in a country notorious for both – will be even harder. However, the mission has accomplished as much as CICIG did in its first year in case investigations and legal reform. Despite its limitations and slow start, MACCIH’s performance does not preclude obtaining far-reaching corruption convictions and strengthening the Honduran judicial system in coming years. As civil society groups seem to be getting past their disappointment that their country did not get a CICIG, their collaboration will be crucial to the mission’s success. * Chuck Call teaches International Peace and Conflict Resolution at American University. Almagro’s Freshman Year: Bold Actions or Unnecessary Risk? Almagro has taken a number of positions that confirm his desire to redefine the OAS’s role in the region. 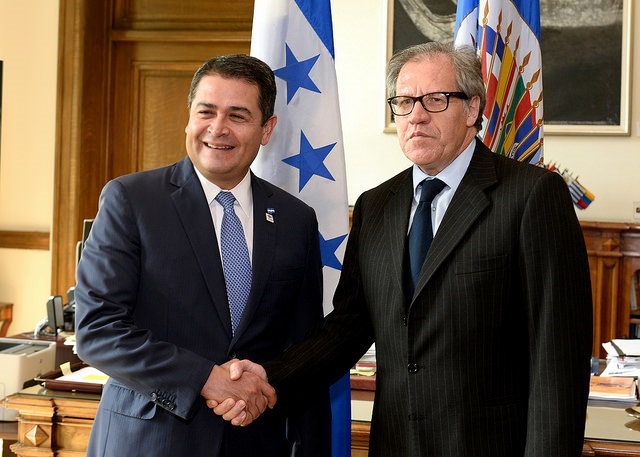 In 2015, Almagro took the lead in developing a plan to fight corruption in Honduras, resulting in the formation of the Support Mission Against Corruption and Impunity (MACCIH) – a watered-down version of the successful UN-backed CICIG in Guatemala. The jury is still out on whether MACCIH will have a serious impact, but Almagro has staked his reputation on its credibility. He has claimed that the impeachment of Brazilian President Dilma Rousseff lacked sufficient justification and that accusations against her were politically driven. Almagro also called for anticorruption investigations under Operação Lava Jato to continue as essential for the rule of law. Prior to the Peruvian elections, Almagro warned that the disqualification of two candidates reflected unequal application of the law and raised concerns that the contests would be “semi-democratic.” Following a meeting with disqualified frontrunner Julio Gómez, Almagro called for the reinstatement of both candidates’ right to participate in the elections. Almagro has taken on some very difficult issues, and explanations for his motivations are varied but not mutually exclusive. Some observers perceive a personal embrace of OAS principles, others detect a desire to avoid the sort of U.S. criticism that plagued Insulza and constrained U.S. support and funding, and still others speculate about his future political ambitions as a reformist on the non-radical left of Latin America. The democratic principles he is defending are clearly enshrined in OAS documents, but his activism has so far not reversed adverse situations: Rousseff was impeached, the Peruvian candidates were forced to sit out the election, and Maduro has yet to soften. Being an “activist” Secretary General in the case of Venezuela entails great risks; his predecessors were criticized both for getting too directly involved in the country’s internal affairs and for remaining passive in the face of growing authoritarianism in Caracas. It seems, moreover, as though Almagro has often acted alone, and the tone of his letter to Maduro was uniquely strident. A great deal is on the line for the OAS. If Almagro’s activism works, it will enhance the organization’s leadership on a range of issues confronting the hemisphere, but it may also put the OAS in the middle of future conflicts in which failure would bring a loss of institutional credibility. * Maria Carrasquillo is a recent graduate of the M.A. Program in American University’s School of International Service and a research assistant at the Center for Latin American and Latino Studies. Honduran President Juan Orlando Hernández, who last month passed the half-way point in his four-year term, has scored some important political gains, with uncertain implications for his country. The Obama Administration has embraced him as a partner in the “Alliance for Prosperity,” to which it has committed $750 million year to “build a safer and more prosperous future for [Northern Triangle] citizens.” It represents a doubling of U.S. assistance. In a decision Hernández said he “would respect,” last April the Honduran Constitutional Court – key members of which the Congress elected under circumstances of questionable legality when he was Congress President – allowed him and other former presidents to run for reelection. The Chairman of the Congressional budget committee last week said there “should be no doubt” that the party is committed to Hernández serving a second term. He successfully parried efforts to create a copy in Honduras of the International Commission against Impunity in Guatemala (CICIG), the UN-sponsored body with extensive powers in that country. The final terms of reference of the OAS-sponsored “Mission to Support the Fight against Corruption and Impunity in Honduras” (MACCIH) aren’t as loose as he had proposed, but many of its key definitions, personnel, and funding remain highly uncertain. OAS Secretary General Almagro’s public blessing of it was a public relations coup. Hernández is not without critics in Tegucigalpa and Washington – even if their attacks have not thwarted him. Opponents claim that his desire to overturn Constitutional prohibitions on a second term was more blatant than that of former President Mel Zelaya, whose removal by the military in 2009 Hernández supported claiming that Zelaya violated the prohibition. Hernández has admitted that his party received funds embezzled from the national Social Security agency. The Indignados, a grassroots opposition, doesn’t have the lobbying resources that the government has, but they have mobilized massive peaceful demonstrations, and veteran Honduras watchers praise their idealism, discipline, and maturity beyond their youthfulness. Hondurans and foreign governments often favor leaders whose appearance of power promises stability, rather than favor processes and values – such as transparency and inclusiveness – that promise more effective democratic institutions. Hernández was elected with barely 35 percent of the vote, but his growing power, coinciding with the weakening of legislative and judicial institutions, has concentrated power on the executive. The country arguably faces one of the most complex situations in its history, on the cusp of either difficult change, such as reducing shocking levels of impunity, or a deepening of the current crisis. The economic and political elites who control the nation have driven it into a rut from which “more of the same” does not appear a viable way out. Hernández won praise from the international financial community by pushing through fiscal adjustments, yet these measures increased inequality in a country where half the population lives on less than $4 a day. Preliminary data show that austerity has brought about an increase in unemployment and underemployment, which already affected roughly half of the labor force. A U.S. and Mexican crackdown on Central American migration has reduced one of the only options that young Hondurans fleeing poverty, violence, and impunity thought they had. While many Hondurans may wind up accepting a President’s reelection to a non-consecutive term, Hernández’s big push for a consecutive one and his talk of a “new social contract” understandably fuels skepticism if not angst. Lobbying Washington: Does it Work? Latin American governments, political parties, and business associations have a long history of turning to U.S.-based lobbying, legal, and public relations firms to advance their interests in the United States – with mixed results. Both national and multinational groups have been utilizing lobbyists since at least the 1940s, when the U.S. government began registering foreign agents. Their most consistent goal over the decades has been to influence U.S. policy on foreign trade and investment, but they have also aimed to improve governments’ sagging reputation and protect them from adverse policies. In the 1970s, a number of military regimes and right-wing political groups in Central and South America hired lobbyists to devise and implement strategies to counter criticism of their human rights record – to preserve trade and military assistance. Some 30 Latin American countries and interests groups in 2010-14 registered foreign agents to influence U.S. policies. The Bahamas Ministry of Tourism spent the most, paying $128.9 million to promote tourism – as well as to monitor and speak with Congressional representatives about U.S. legislation related to transnational financial activities in which they are involved, such as the regulation of offshore tax havens and online casinos. Ecuador, which at $1.1 million ranked twenty-second in 2013, spent nearly half a million dollars lobbying in support of the ultimately failed Yasuni rain forest oil drilling initiative. More recently, the government of Honduras – burdened with the image as one of the most violent, corrupt, and crime-ridden countries in the world – hired lobbyists to “provide ongoing strategic counsel, media relations (proactive and reactive outreach), and third-party relations.” The firm, winning an initial one-year contract for $420,000, had just completed a nine-year relationship representing Russia. A review of the U.S. Foreign Agents Registration Act (FARA) records indicates that foreign lobbyists represent almost exclusively governments, state agencies, and the private business sector, and that more popular civil-society actors – such as labor unions and indigenous organizations – are notably absent. Even though foreign governments obviously judge the investment worthwhile, the impact of foreign-funded lobbyists is difficult to measure. The Honduran government’s new push to burnish its image has paid off on Capitol Hill, according to observers, but a new initiative to reduce Honduran corruption doesn’t appear to have gone exactly as Tegucigalpa hoped. Forced to respond to a protest wave calling for the creation of an independent investigative body similar to the Comisión Internacional contra la Impunidad en Guatemala (CICIG), the Honduran government agreed with the OAS to create the Misión de Apoyo Contra la Corrupción y la Impunidad en Honduras (MACCIH) as a collaborative effort. MACCIH indeed lacks the independence – and the potential bite – that CICIG had, but it is significantly tougher than the Honduran President Juan Orlando Hernández initially proposed. In this case at least, lobbyists have helped the government gain access and public relations points in Washington but didn’t get it off the hook entirely. * Aaron Bell is an adjunct professor in History and American Studies at American University. CLALS and the Inter-American Dialogue this week hosted a conversation on the crisis in Honduras with experts Hugo Noé Pino, of the Instituto Centroamericano de Estudios Fiscales, and Carlos Ponce, of Freedom House, and about a dozen of some 80 participants spoke up. The following are key analytical points that were broadly accepted during the 90-minute session. Honduras is experiencing a multi-faceted crisis – economic, political, judicial, and security– that has grown steadily worse since the 2009 coup and shows no sign of abating. Economic growth (1.5 percent per capita) is too low to alleviate the country’s severe employment problem (affecting half of the working-age population) and poverty (62 percent). Recent polls indicate that some 63 percent of all Hondurans would leave the country if they could. Violence, corruption scandals, and the steady weakening of institutions dim prospects for a turnaround. The over-concentration of power in the Executive, the remilitarization of law-enforcement and other security services, and the politicization of the judiciary have undermined what democratic foundation Honduras had built since the last military government stepped down in 1980. The economic and political elites, as well as the media they control, have further stifled political discourse. The Sala Constitucional of the Supreme Court and the National Electoral Tribunal have been stacked to tightly control preparations for elections scheduled for November 2017, apparently with the intention of ensuring the reelection of President Juan Orlando Hernández. The Honduran political class lacks the will to root out corruption, and is united in resisting developing the capacity and programs to do so. The embezzlement of more than $300 million from the Social Security Institute – funneling part of these funds to the ruling National Party and a variety of fronts – led to the flight of the investigating fiscal (who left the country because of death threats to himself and his family) but little else. Indeed, the most significant law-enforcement actions, such as the indictment of members of the Rosenthal family on money-laundering charges, have come from the United States. Some 80 percent of crimes in Honduras go uninvestigated and unpunished; some reports put the figure as high as 96-98 percent. A Comisión Internacional Contra la Impunidad en Honduras (CICIH), adapted from the successful CICIG model in Guatemala, would be a healthy way of addressing ongoing impunity while building investigative and prosecutorial institutions. The economic and political elites solidly oppose it. Even if Honduras accepted a CICIH, alone it probably would not be a silver bullet. The OAS’s planned “Mission to Support the Fight Against Corruption and Impunity in Honduras” (MACCIH) – announced in late September jointly with Honduran President Juan Orlando Hernandez – shows little promise of success. Its mandate will be to diagnose problems and write reports, not take action or facilitate a serious, inclusive national dialogue. Opposition to the current Honduran government is strong and growing, but it has not yet institutionalized. Peaceful marches organized by the Indignados and other organizations have mobilized tens of thousands of citizens outraged by government corruption and its inability to provide even basic citizen security. Among the masses have been an unprecedented number of middle-class and upper-middle-class persons – not seen during previous crises. Opposition groups are still struggling, however, to coalesce into a viable, institutionalized political force. Sustaining effective leadership and overcoming pressure from the government and Honduras’s two traditional parties are difficult challenges for them. There are no magic or quick solutions to the crisis. Any solution would have many moving parts, including recognition by elites that their own assets are threatened by the deepening chaos. The government will have to be held accountable for corruption. The judiciary will have to be strengthened and made independent. The military will have to return to the barracks. The media will have to be professionalized. Civil society will have to be empowered. The U.S.-sponsored “Alliance for Prosperity” is unlikely to help Honduras – and could make things worse if it doesn’t challenge the status quo. Honduran observers believe that the $250-plus million dollars from the program should focus on deep change – the product of a broad national dialogue – and should be conditioned on deep reforms, rather than working with just the sitting government, which has shown no willingness to reform. U.S. cooperation in counternarcotics and other security operations might in some cases expose partnered services to U.S. respect for human rights and democratic institutions, but the resources transferred in the process also serve to strengthen them and make them more independent of civilian authority.